Fleas are ugly, nasty parasites that are one of the most difficult critters to get rid of. Which is why, prevention - all year long, is necessary. Fleas are about ¼-inch long, are black/brown in colour, have no wings but do have long hind legs, which they use for jumping from one host to another. Fleas require a host - your cat or dog - in order to survive, as they live off of their blood. It is also important to always rake the leaves - flea larvae don't like light. Watering your lawn on a regular basis may also help keep fleas from residing in your lawn. "A majority of the fleas and larvae will be within 50 feet of your dog's favourite resting spot, so focus on those areas," reports Pet Supplies Review. Another line of defence is topical medications, the best of which are available through your veterinarian. There are many different prescriptions available - contact your vet to determine which one is most appropriate for your pet. Regular housecleaning, such as vacuuming weekly and regularly washing your pet's bedding, will go a long way toward preventing fleas. 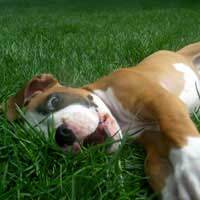 Your dog is uncontrollably scratching itself: to determine if the cause is in fact fleas, do a couple of things. Look under your dog's fur for dark specs. Those black bits are flea dirt - they are actually flea faeces. Pick them off the pet and place them onto a wet paper towel. If the specs morph into something that resembles a bloodstain, then your pet has fleas. Flea dirt is a lot easier to spot on lighter coloured pets. On darker coloured pets, comb through their fur with a flea comb - its bristles are very close together and will pull out any flea dirt. Before buying every flea-destroying product on the market, thoroughly vacuum your house. "Fleas, as eggs, larvae and pupae, may spend 90 per cent of their time off the pet [and] on the carpet or furniture," reports the Cornell Co-operative Extension - Insect Diagnostic Laboratory. Remove the vacuum bag, seal it and destroy it immediately - fleas are hearty parasites and will continue to live in the vacuum bag if not destroyed. For dogs and cats (they can share fleas) - a specially formulated flea bath product, available at your vet or pet store, will do the trick. Shampooing will have to be accompanied with extensive brushing with a flea comb. For household flea extermination, there are numerous products available. The most important thing to look for in a household anti-flea product is one that will effectively kill all stages of a flea's lifecycle, not just the adults. Female fleas can lay hundreds of eggs at one time. Make sure to follow all of the product's instructions exactly as described. You may need to use a combination of products, multiple times, throughout a 30-day period in order to completely rid your home of the fleas.